My steps to the Universe. Translator’s Note: The word used by the People of the Dolmens to describe themselves is the Russian word мудрец which sounds like moodrets. That word means Wise man, but more accurately means people of the civilization of Moodr. That civilization was on the planet for one million years, and about 10 thousand years ego they started entering dolmens. The author talked with her Moodr Helper, a man named Margelan, and he suggested that this word not be translated either to Russian or English. Throughout this book the Men of the Dolmens will be referred to as Men, People, people of Moodr, or Moodrets (not a plural term). The first time I saw dolmens was near the city of Gelendzhik in 2001. Like everybody I took an excursion to the dolmens and listened to what the guide was saying about them. There were different guides; some talked about dolmens, saying that they were memorials of ancient cultures. But sometimes I’ve heard that it is not a simple structure, that there is some spirit associated with the structure and some people can feel it. Some ancient people went to the dolmens and stayed there in deep meditation. They had highly developed knowledge and each of them knew very well about one or more aspects of life on Earth. It was a very different civilization where Wise Men knew that a new civilization would come, like ours now, and those spirits from the dolmens, can help us discern what to do in order to get out of our dead end lifestyle, where they knew people would eventually be. They could teach the people how to organize Man’s lifestyle so he can find Love, Joy, self-sufficiency, and trust in the future. I, like all tourists, came close to the dolmens and touched them, sometimes with bare feet, but I felt nothing and went away thinking that it was just rocks. One time, on an excursion in “Shyrokoy shely” (near Gelendzhik) we visited a dolmen, the only one in this village. I, like everyone, stayed near it and suddenly felt that something changed inside of me; some unusual feeling came to me. The world around me became beautiful, kind, and happy. My hearing was different; how birds sang, how water sounded in the river; everything was beautiful. I did not want to leave the dolmen, but the guide led everybody to a rock alley of huge rocks. We were told that people built their dolmen from those rocks. I was sitting on a big rock thinking that something extraordinary had happened to me; there was such nice peace in my soul. When we went back to the bus, I tried to get back closer to that dolmen, but the guide said, “Those feelings will stay with you the whole year, every time you think about this dolmen.” It was true. I verified it on myself. All year, if some everyday confusion occurred, just imagining that dolmen made everything normalize. Peace and calming come to me and I could find a natural exit from the stressful or confusing situation. I become sure that the dolmens are not just rock construction; it is something very unusual. There is something pleasurable and subtle that happens to a man near them. The next year I went to Gelendzhik again, with only a thought to visit the dolmens, to be there alone without a guide. At the bus station I met four people, who had the same desire. They had visited dolmens many times and knew all trails. I joined them and we chose to go to “poselok Vozrozhdenie” about 13 kilometers from the city. There was woman in our group, Nadezhda, (from a suburb of Moscow) who can quickly and accurately find “power places.” She told us everything the Wise men of the dolmens had told her, even though she does not see them. There was another man among us, Yuri, who saw them and can describe what they look like, but he did not communicate with them. Near the last dolmen Nadezhda repeated for us what the wizard told her about each of us. I remember that I was told I would have some kind of awakening. Of Couse, I had no idea what it would be and how it would come, but I was glad. I really wanted to hear and see the Wise Men for myself, but it did not happen right away. Two years passed before I started seeing them in the dolmens. At first I thought that it was my imagination or fantasy. In the beginning my questions were short and timid. The answers were “yes” or “no”, but some of the times I had real conversations with the Dolmen Men. They answered most of my questions with joy. I see the facial expressions very well; smiles, joy, and kind eyes. They all are different with different height; tall, middle, and short, but not giant or dwarf. They are people like us. Usually their hair is near shoulder length or longer. The Color of hair ranges from blond, fair, and dark or absolutely silvery white. Eyes are blue, gray or dark. Faces are usually bronze, or light. The clothes are different colors too, but usually gray, some kind of green, or some darker color, sometimes red. Sometimes I see the Dolmen Men as transparent. The ages are different too, from young to very old. And everyone has their own character. Some of them look very stern. I do not even know what to ask, but I ask anyway, and when they start to answer, I see they become softer and they really want to communicate with me. Sometimes they look a little cautious, and then they become good-humored. But sometimes I see a kind and gentle face right away, and he is ready to answer all my questions. I just have to ask. What I understand for sure is that if I can see him, he wants to communicate with me, and answer my questions. It is very important in communication with the Dolmen Men, not to worship them, make them a cult, or pray to them. Just treat them with love and gratitude, as they are our far ancestors who went to a dolmen to help their descendents with the power and purity to achieve our bright thoughts and dreams. The answers often are similar from different Dolmen Wise Men. I think it’s related with that time they lived, and that they all want to help us to understand the same things, how we need to live, and act right. There is only one Truth. Naturally, they give the answer for me so I can understand their thoughts. Maybe another man will get a little different answer for the same questions. It probably depends on the background or knowledge we have in different areas. So far, as I talk to them on different topics of our lives, I get different answers that are understandable to me. Often I meet Dolmen Men with the same intention to give people their wisdom. For example: there are five dolmens of creation, a few of health, two of pure thoughts etc. It looks like they all talk about the same things. But each of them speaks with their own wording and wants to give their own perspective. All answers I write very quickly and I never change or correct anything. In general I am sure they are not mine. I write only what the Dolmen Men said. At first, I communicated only with People of the dolmens. Then I started to find the power places – the place where dolmens once were, but were destroyed many thousand years ago with only rocks remaining there. But the spirit of the Dolmen Wise Man is still there. If it is a power place and the Dolmen Man wants to say something to me, I will see him for sure, and he will answer my questions. The main idea that many Dolmen Men want to communicate to people, is that each man has to have his own piece of land where he can create his Space of Love – that is he can give to each plant, animal, insect, and even microorganism his love and receive the same from them. Their love will protect this man, help him to live, heal him, help him to live free from the modern system, and help him to open all the abilities that Creator gave to us. 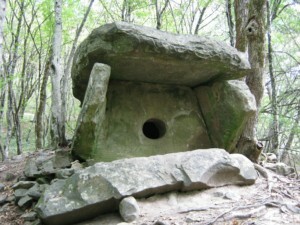 There is one particular dolmen, at Pshada (a village not far from Gelendzhik). I can say it was the first Dolmen Man with whom I started to communicate constantly. He said that he is my helper, and his name is Margelan. He helps me in everything, but always thinks that I have to make my own choice about what to do and how. He never imposes his way on me. He just helps me to make my strong wish or dream to become real, if my thoughts are pure and clear. A: “First, you are not a medium, but a man beginning to awaken. Second, you do not practice spiritualism. Yes, you communicate with the spirits of the People of dolmens that you see, but you do not hear their voices. They just transfer their thoughts and you catch them. People entered the dolmens on purpose to pass their knowledge to future people who can catch their thoughts. In time there will be much more of these kinds of people on Earth. Then we will pass our knowledge to everyone who will come to us. It will be simple and easy for many people, but very important. Right now it is only beginning. That is why now many people and you, here, are afraid of our communication. Q: I do not fear, but wonder how to explain to people that it is not spiritualism? A: It is very simple. We, people in the dolmens or power places, make a choice our selves about who can accept and pass our knowledge on to your generation right now. Even people, who don’t see and don’t hear, are a little changed after visiting us. But spiritualism gives nothing; also not all dead people want to be bothered. Usually people use them for prediction, but we do not do prediction. As I said before, with our speed of thoughts we try to speed up your dream and your pure thoughts wish. Q: Yes, but perhaps many will not understand me now? A:Yes, they will not. And you must not try to prove anything to anybody. Their time will come. Even now you see there are people who understand you, and soon there will be more. Q: Can I give what you just said to me to people to read? A:Yes, you can. People will start to differentiate spiritualism from hearing thoughts of spirits of Wise Men from the dolmens. We all are here to help you. Q: I would like to write a book about conversations with People in the Dolmens and You. What do you think about it? A: It is good. It will be hard for you, in the beginning, but do not stop. Write clearly about the knowledge you have heard. People do need it now. Do not pay attention to the negative responses, you will hear around it. It is not important. What is important is to pass to people what you already know. This work will bring people a lot benefit, and will bring you great joy. People are waiting for this book. Q: Can I give your names in the book? A: Yes, if you already know them, you can pass them to everyone. Q: Some of the words will be repeated many times in the book. A: As you write what you perceive from all who give you this information, you will use your own familiar words. But everyone who gave you information applied their own knowledge to answering your questions pretty accurately. Of course, all people at this time see how complicated is your system, your civilization. Therefore it is almost impossible to give short answer in two words to some of your questions. So you received the same knowledge in short answers. You are not a lawyer, or a medic, or a chemist, or a physicist, but we need to say a lot about it all in short answers. All people in the dolmens are very happy that you are writing about them and their shrines. The people who will come to us will start to hear and see us in time, and they will have deeper and greater conversations. The children who will be born in certain conditions, will be able take in all accurate information about how to change your life completely, how to clean the air, water, and earth from all poison that your civilization has created. Q: Who are you – ancestor, friend, mentor? Q: How long are you going to talk to me? A: As much as you want. Q: Why do you need me? A: I need to communicate with people. Q: I can ask you everything? Q: Can you predict the future? A: I do not do predictions. I speak about materialization of your thoughts. A: What you really want or somebody really wants will be fulfilled. Q: Do you help to materialize thoughts? A: Yes, with the speed of my thoughts, I help to materialize yours. Q: Can you speed up any of my thoughts? A: Yes, if they are pure. A: It is thoughts which do not do any harm to earth, people, plants, animals and all life, but only helps them. Q: Tell me, what is power? A: It is energy. There are many of them. They are united into one. They are controlled by different directions. There are energies with Love, and there are energies without love. Q: Do you have Power of God? A: Yes, it is energies with Love. Q: Do I have a Power? A: Yes, you have energies with Love. But people now are very weak; they use or activated few energies. Q: Do you help me to activate or use all energies? A: Yes, but it is just a beginning, and it is all up to you. Q: What do I have to do to activate all energies? A: Now it is hard in this condition, for us to help you. For the present live as you live now. Q: Do you help people to activate all energies? A: Yes, when they come to us. Q: What do they feel, when you help to activate energies? A: All are different. Some start to see, hear and feel us, others feel healthier, and some even change their life style, and many other things. People start to feel the Energy that God gave them. Q: Tell me. You have hair of different lengths. Did you cut them? A: No, every man can control the length of their hair. He can stop and start to grow them. Q: What about beards. Did you shave as modern men do? A: Those who want, have the beard and mustache. But if a man did not want them, they did not grow. Q: Can I cut my son’s hair, and my son cut mine? A: Yes, but a little. A: There is power in the hairs. A: Hairs have a connection with Cosmos, the Universe. They help man to awaken and see clearly, i.e. to see what, for modern man, is not accessible. A: Yes it is true. It depends on each person, from their life style, thoughts and actions. Q: Tell me. Why are there are many bald people in our time? Their hairs do not grow themselves? A: Yes, it is related to altered DNA. People of your time do a lot of destructive and unhealthy things for themselves on Earth. Some elements, and some processes appear on the surface of the Earth that affect people and their generation. This is one of those appearances. There are many more that people do not see so obviously, they just start to feel it as illness with age. Q: So, baldness is an illness? A: No, it is not. Like I said, it appears in DNA of your parents or ancestors and it passed to the next generations. Q: What do you mean elements and processes? A: There many elements in Earth that people brought up on the surface as raw material. To bring them up people do a lot chemistry experiments and large scale explosions. People living on Earth breathe and receive all of it. Weak people just get weaker by these changes, and then pass it to the next generations. Q: But I have heard that baldness can be cured? A: Yes, of course. But this work needs to be purposeful and precise in order to change the DNA. A: Yes, you need to have strong desire and abilities. Q: What abilities are you talking about? A: There are many of them, and it is desirable to combine them together. They are pure sun light, pure water and stimulation from grass/herbs on hair bulbs. A: It is individual. Every man has to feel for himself, what herb will help only him. Q: But if man is absolutely bald, does he have any hair follicles? A: There are follicles everywhere hair grows, they are just passive and weak. Q: What do people need to do in order to see and hear you (Men of Dolmens)? A: If a person will come to us with pure thoughts, absolutely relaxed, sit for a few minutes, and ask a question that is really interesting for him; that it is his dream and he really wants it to happen, also it does not have to affect other people even indirectly, he will receive the answer, for sure. The answer, surely, will come through his thoughts and the man will feel that it came to him, and he did not imagine it himself. To see us is more difficult, it depends on many factors: from us, from past lives, from the emotional condition of the person and many more factors. For the same question in another time and other condition I got this answer. A: Every man can see and hear us. It is all earned or gained by the person in past lives. And now it is time when everyone can use these abilities, if they were accumulated in a past life. Q: Tell me, if man changes his name or family name, does it change his destiny? A: A lot is related with the name of man; a name does affect the man’s life. The family name is constantly with a man, it carries the energy of kin. Q: But when a girl gets married, she takes the family name of the husband. How is that? A: Now, then the kin energy helps her to meet her Love and the family name of her husband unites them. Q: What do you think about superstition? A: Nothing. It is fear. Q: What do you think about signs? A: Nothing. It is all in people’s head. It is artificiality. Q: What is a sign? A: It is notice or warning. Q: How to know that it is sign? A: You need to feel it, and it repeats thrice. Q: But it repeats a different way? A: Not always. And it can be a felt at once, right away. Q: Can I hear horoscopes? A: Yes, they tune or help you to do some things. Even so it is just a game. Q: But if a horoscope is done for the exact person by a professional astrologer? Is it a game too? A: There are some astrologers who know stars and their position, and they can do a correct interpretation of what the stars tell. But there are very few of that kind of astrologer on Earth. Q: What do you think about, “feng shui”? Q: I see that you often laugh, you like classic music, and you are cheerful at all times. A: I am the same man like all, I like some things, and some things I do not. I love life. Basically, all Dolmen Men are near their dolmen. I see them in the dolmen, like a rock room, behind a stone table with clear light, or they just walk around the dolmen. But that is only when you come to them and they communicate with you. Even if there is no dolmen but a pile of stones, the place of power is there and they never go away. There are no empty dolmens, unless they were moved to another place like a museum exhibit. There are some Dolmen Men who can be a little farther from the dolmen or place of power, about 30 meters. They can meet you and help you come to their dolmen. Yet, I think, I see them in the same clothes, the same appearance, what they had when they went to the dolmens, because they never change their clothes or appearance. Their emotions always change. They smile, rejoice. They are always good-natured and gentle, especially when you start to communicate with them and come more often. They wait for people and want to pass them their information; they want to help people. That is why they choose to go to the dolmens. Q: Is it true that you went to the dolmen alive, in-to deep meditation? A: Yes it is true. Q: Why did you go to the dolmen? A: I knew that a time would come when people need me and I would be able to pass them my information. Q: Do you communicate with many people? A: Yes, the time has come when people have started to come to me, and I can help them, like I help you. Q: Do you rejoice when I can bring people to you? A: Yes, it is good. People gradually will change, and I can help them. Q: Do you communicate with other Wise Men in dolmens? A: Yes, and we help people together. Q: But if an evil or bad person comes to you? A: We try to reassure and calm him. He will change in time. Q: How many years were you in the dolmen? A: I did not count. Q: Are there many dolmens on Earth? How many years’ did people go to them? Q: But people often can no longer see the dolmens at this place; but the Place of Power remains here? A: Yes, many dolmens were destroyed during these thousands of years. Yes, the Place of Power stays there and soon many people will see Men on them. Q: Tell me. I see that many stones near dolmens bear the same information like the dolmen, why? A: Rocks near a dolmen are like storage of the light of that dolmen. Men of dolmens use them to show people more detail about how they can help them. The rocks bear information and help the Man in the dolmen to pass his thoughts and his dream into every man who touched that rock-shrine. As all people are different, and they need different help. Coming to the rock-shrine every man receives what he needs at this moment. Very often people’s feet walk to the shrine that he needs. He was sent there by the Man of that dolmen. At a different time on the same question I got another answer. A: Very often, a Dolmen Man, through this shrine, can explain how he can help this man more efficiently and clearly. It’s not as strong as near the Place of Power, but little by little it helps a person to eliminate many accumulated problem in his life. Q: But if people could know this shrine and could come to them by themselves? A: It is very good. Often people know themselves what they need. After they visit a dolmen they can feel what shrine can help them better. And visiting that shrine, with pure thoughts, they get help to implement their dreams. Everyone has a different dream and it will come to life if it doesn’t do any harm to anybody and anything. Q: So, what is the Shrine? A: As you already know, a Shrine is storage of light. It is a place where man can communicate with the Universe, with Creator. The more clearly a man understands “purity of thoughts”, the faster Creator and Universe will answer him, and help to manifest and implement his cherished dreams, and wishes. Q: There are whole villages of Dolmens and Shrines. A: Yes, these places were very comfortable and suitable for deep meditation, so they put their dolmens on these places. People who went into those dolmens were united with one strong dream; to preserve everything that they know for future generations, to help people to come to “Primary Source”. Everyone has their own thoughts and their own life skills. Q: But if a person did not have purity of thoughts when they come to Dolmens or Shrines? A: Every man had purity of thought in the beginning, but many do not think about it now because to him the most important thing is to survive in any circumstances. But a man coming to a Dolmen, to its Shrine, gets calm and starts to think what he would like to have, not just for himself, but for all life around him. Gradually he will change, and with time he will have pure thoughts, and therefore the abilities to implement his dream. Q: If a person feels the vibration of a dolmen, it means that dolmen affects this man stronger or not? A: It depends on general condition at that moment. He can feel or not, but the dolmen already starts working with a man who comes to it, and he has to rejoice, if he feels it, as it is communication with Man of the Dolmen. Ask questions and you will get answers. Q: How to understand “has to rejoice”? A: Joy is good, a man’s perception gets sharper, emotions lift, general condition of health improves, and fears go away. If you will often remember and imagine this condition, your life will be joyful. Q: Tell me. Sometimes, I see many faces in big rocks, but they do not communicate with me. Are they dolmens? A: Yes, they are dolmens – Places of Power. People went to them by taking apart their body atom by atom and reassembling it with the rock. Those people – a whole group of Moodr Men, had one united thought, one dream, one knowledge. They knew that they could bring a lot of good to Earth, to people of future generations, to their descendants. They saw and knew that men were losing many of their abilities, and that a time would come when only they could fix or correct all the problems on Earth and continue the existence of man. Around those Dolmens there are a lot of rocks and stone Shrines that help the modern man to change himself, to eliminate the hustle and bustle of your time, to get information about himself and what to do, so his life and the life of all Earth can bring benefit to every man and all the Universe. Around those Dolmens there is a whole complex of Shrines of light. They change man, improve his life, health, and help implement his most pure and sacred dreams. When a normal average man of your time just walks around these Shrines near those Dolmens, it already changes him, even if can’t feel it right away. There are a lot of such places on Earth. They are very powerful and effective places. Q: Why they do not communicate with me? A: They have a different mission. They give their information thru the cascade of shrines near them. And you receive it. Q: What is their purpose? A: With their conjoint power they implement the thought, the dream that they had when they entered into the Rock. Q: Did they go to the rock, at the same time like the Men of the dolmens? A: No, they have more powerful energy and it is united. They were first. They suggested to people, to Moodr Men, that they need to go to the dolmens, rock structures. They knew it. I asked my Helper a lot of questions about modern food. What we can eat? Q: Can I eat meat, chicken? Q: Can I eat fish? But what is most interesting is that after I asked these questions and got answers, some changes happened with my son and me. We didn’t just stop eating meat and fish; it is like they do not exist for us anymore. The taste and smell of it does not have any effect on us, whether cooked, fried, or smoked. It is like taking a bite of soil in your mouth. I know many people try very hard to quit this habit with a little success. But I think if you will come to the dolmens with these thoughts and ask for help, you will get the same results as my son and me. Try it, as dolmens do everything to help people to live a long happy life. We used to buy the cubes of soup with mushroom flavor. When I put it in hot water, a nice smell of mushroom soup arose. But when I put a spoonful of that soup close to my mouth – I got information that was harmful, a poison. With regular mushrooms I do not have this reaction. It means there was something in those cubes that can harm my body. So we quit this food too along with so many other foods without these cubes and meat. Q: Tell me. What did you do, so that we could quit this addiction to eat meat and fish? A: It is very simple. I knew that it was your wish to stop eating meat, chicken and fish, and I helped your body to stop perceiving and accepting this “food” any more. Q: How to understand “stop perceiving and accepting”? A: Man is so constituted. You can program feelings of disgust to a harmful product. It’s just a little change in DNA. Q: So, you can change DNA in a man’s body? A: Yes. You know we people in the Dolmens want and can do a lot for a good kind person. We are to help him. And if man has a wish and a right life direction we help to implement it. If a man himself wants to quit his bad habit of eating dead animals and other things harmful to the body, we help him to do it. But often some person comes to us with a wish to quit some addiction in his mind, but he is not completely ready for it. There are two opposite wishes in conflict in him – to quit, but “now I want to have more.” So he will live with what wins in him. We cannot inhibit man; it is his decision, his choice, his life position, his will, his statement, and we do not violate it. Q: Why should people not eat meat? A: Meat is a product of a living being. Animals await protection from man, but he kills them. Animals know and feel, that man loves them and then suddenly feels that a man is going to kill them. The entire being of that animal feels and carries the fear and pain that man gave it. And when man eats this meat, that fear of death and that pain settles in man. That is why there are so many animal fears in man for his existence. So what do we have? Modern people fear everything. They fear for the future, for the future their children and loved ones. Also modern animals have a lot of diseases; many people even do not know of some of these diseases. Man eats this meat and gets those viruses, and they destroy him. That is why the life of man so short. Q: But why can’t we eat even fish? A: Fish is also a living being and they have their purpose on Earth. They have to live on Earth and help man. They clean the water on Earth. And in natural conditions there are as many of them as is needed in that water (lake, ocean, etc). When man depletes the fish, he causes disharmony in nature. But artificially grown fish also have many diseases, which harm man’s health, and threaten his life. Q: Tell me, as plants are alive too, they know and feel us, but we eat them. Do they feel bad too? A: The plants are alive, but they are not a being. Creator gave purpose to all living things. Plants do know and feel man, his energy, and his warmth. They know what man needs for his existence. That is why plants give their fruit and seeds to man and are very happy if he takes and eats them. Of course, if man breaks a tree or some grass without any reason, he does harm to the plants. But if man cuts a tree or grass and he has goal, and his thoughts are pure, all plants know his thoughts and help him. And if plants grown by one man for himself are personally watered with his own sweat, that plant even knows his illness and heals him. The man, without knowing why, just wants to come to this plant and eat it at the right time. Q: What vegetables and fruits help to speed up our thought? A: There are many of them, but they are weak now. Now, they just help you to live. Q: But nevertheless some help more? A: All are the same. Only what you can grow on your plot, hectare, or dacha, with your love will be only for you. Q: They will change me? A: Yes. They will heal you, change you, and help you to live a healthy life and speed up your thoughts. Q: What product can be combined together? A: Every vegetable or fruit will carry their own Power and you will feel it. All that you call produce, does not give Power. All that has been cooked, stored long after harvested, grown by someone else, prepared by someone else’s hands does not have or give Power. Q: Can I use vegetable oil or butter? A: So far yes, in these current conditions. Q: What do you think about sugar? Q: Can I eat it? A: Yes, for a while, in these current conditions. Q: Does honey speed up thoughts? A: No, at this moment the bees are very sick, but honey is better for you than other products. Q: What do you think about alcohol? A: Not really. It is Unfavorable. Q: What about infusions, even in drops? A: For a while you can, but very few. Q: What harms me most? A: Only fear, thoughts about pain, about illnesses. Q: Can I eat eggs? A: For a while yes, but you will forget about them in your domain. Q: You often tell me “in these current conditions”. What do you mean? A: You know that conditions of life for man now are very complicated. You cannot get other products, but you need food to support life of your body, because you cannot live without it. Q: But what condition do we need for our life? A: It is a very important question. In short, you just need to create a life space or space of love that will hear you, feel you, protect you. You will feel for yourself, what you can eat, what your body wants, and what does not harm it. Q: How to build your own life space or space of love? A: We can talk a lot about that. In short, everybody needs that space from birth. Parents have to build that space for their kin. It is a Kin Domain. It could be a hectare or a little more, where a man can grow perennial plants; planted forest, fruit trees, nuts, berries, and flowers, also a vegetable garden. Man does not have to plant more vegetables than he can eat in one year. But he will eat vegetables and fruits that know him, heal him, and protect him. If people will share with each other or sell surpluses, those vegetables and fruits grown and given by kind hands, will heal all people around that place. And you need to give love to bees and give them opportunity to make themselves healthier, then honey will help you to speed up the thoughts of man. Q: But now it can only increase my thoughts? A: Yes, if you have pure thoughts. Q: What good can I do for Earth and all life, for people? A: For a while nothing, but you have good thoughts and I will help you to fulfill it. Q: That relates to my kin domain and kin domains settlements in Russia? A: Yes, it is your dream about kin domain; yours, your son, your granddaughter, and people who want to live in eco settlements. Q: How will the Earth react to being divided into hectares, on eco settlements? A: The Earth is waiting for when people divide it into plots, and can touch it with their hands. When people can give her their warmth, love, and care, she will pay back with the same. In eco settlements people united with the same thoughts, one dream, unified interests, they will be supported in everything. Man will revive Earth, and she will give everything to Man. Q: It will be hard in the beginning? A: Yes, in the beginning, it will usually be hard, but in a year or two fear will go away, everything will become normal and will bring joy. Q: What fear are you talking about? A: People of your time have fear of everything. Many have fear of failing, fear of difficulties, fear of losing money, and so on. But those are all little things. The main thing – to have a great wish to plant a tree with love and plants will start to grow. If you have confidence, that all conceived will succeed, and that you always have enough money, they will come. It will turn out, that everything will bring joy. Always remember – fear destroys your joy, and slows down all your innovation. Q: I heard that after a visit to a dolmen you should not bathe for a few hours. Is it true? A: After visiting a dolmen or Place of Power man needs rest, at least 3 hours. You need to sit quietly, rest, be alone with your thoughts, everything that man felt near the Dolmen needs to stay with him – the information, vibrations, emotions, and pleasant state of mind. Naturally, water can partially take it on and wash it away. But it is better to keep it with you.